I’d like to announce some small improvements at wiseNeedle. We’ve added to the search capability in response to user requests. 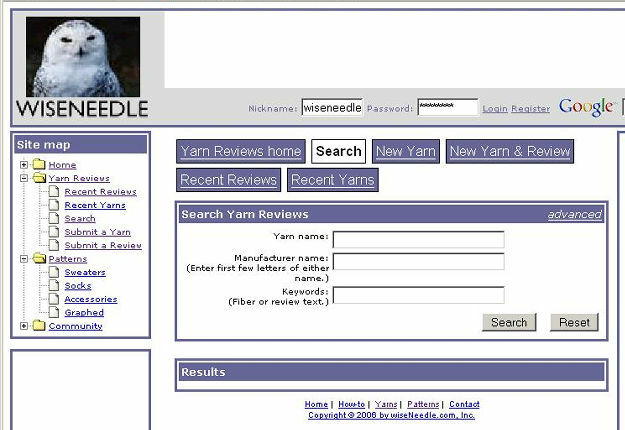 First, we’ve added a simplified search page to the on-line yarn review collection in addition to the previously existing search capability (which I’ll refer to from now on as the advanced search page). Apparently many people were confused by the number of fields, and tried entering data in all of them every time they searched. This led to a large number of false negative results and some complaints that the page was too difficult to use. You can type in as much or as little info as you like – yarn name, the first few letters of the maker’s name, some keywords (this searches the fiber and comments fields). You can still get to the old search page by clicking on the “advanced” link in the corner of the new search page. In addition, should you wish to shortcut the entire process, we’ve added a Google site search box to every page of wiseNeedle, including the front. It appears in the gray bar just under the top banner. Typing a yarn name into that box will bring up every mention of it anywhere on the site – in its original review, in comments tagged to another yarn, on the question/answer board, or even in the commentary here on String. The simple search page will be most useful to people who want to quickly look up stats or reviews of a known yarn by entering its name or maker; or who are looking for some info likely to be contained in previous comments. 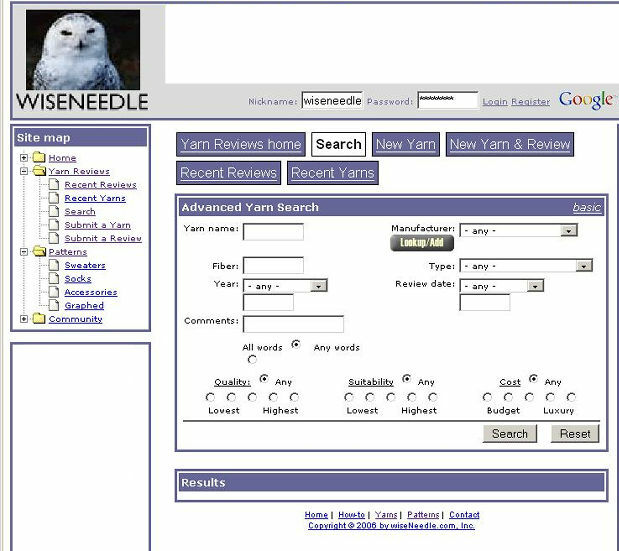 The Advanced search page will be of more use to people who are looking for substitutes, or who wish to search on fiber type, yarn weight, an approximate date of the review, or any of the value, suitability, or quality aggregate scores. In my own knitting, I am finishing up the dropped leaf pullover. I’ve ended collar, using a tubular cast-off. I tried the standard issue one shown on My Fashionable Life, but I didn’t like doing it. Instead I followed June Oshiro’s method, described at TwoSheep. By slipping the available stitches of the ribbing onto two needles (one holding just the knits, and the other just the purls), the cast-off can be treated like any other exercise in simple grafting. The two needle method let me make short work of finishing my collar. I’m now up to sewing the dropped shoulder sleeves onto the body, prior ending off the interior ends and doing the last two finishing seams from bottom hem to cuff.